Episode 18: "Dateline - Execution"
Inside Pentonville Prison in London, Father Dolin prays with condemned prisoner Arthur Donald. Upon leaving, Father Dolin asks if there is any news on a possible reprieve. Informed by the warden that there has been no word from the home secretary, he states his firm belief in Donald's innocence. As the home secretary is currently away from his office for a week, the Father successfully convinces the warden to stay the execution for 24 hours. Father Dolin states that he knows someone who is visiting London who can possibly prove Donald's innocence. With the execution set for the next day, Father Dolin meets with Charlie Chan and finds the detective willing to take the case. Refusing a check for 200 pounds, Chan states, "Trying to save human life is ample pay for services." Chan has less than 24 hours to save the life of Arthur Donald. Meeting with his friend Inspector Marlowe, Chan discusses reopening the case. Marlowe protests that Donald was fairly tried and that here is no reason to do so. Marlowe explains the facts surrounding the case, stating that all evidence pointed to the guilt of Arthur Donald, who had worked for the murder victim, Dr. Roy Beach, who had found Donald, down and out, at a London mission. The motive for the killing was determined to be the theft of a large amount of cash that was found on Donald. Chan feels that the evidence in this case is "almost too perfect." Chan then begins a quick round of investigation. Visiting the widow of Dr. Beach, Chan learns that Mrs. Beach had had an affair with Arthur Donald which was discovered by her late husband. Next, he visits the mission where Donald often stayed and where Dr. Beach had found and hired him. There, the mission padre informs Chan of his belief that Donald was not capable committing such a crime, even though the murder weapon was found at the mission where Donald often continued to stay. At Pentonville Prison, Chan speaks with Arthur Donald. Donald tells how Mrs. Beach had extravagant taste and that there was friction between herself and her husband. When asked about his relationship with Mrs. H, Donald vehemently denied having had an affair with her and that the prosecution tried to pin that allegation on him during the trial. Donald also recounts his interactions with Beach on the day of his murder, noting how he had taken the doctor to have a passport photo taken and how the Beach had given him a large sum of money to hold as he didn’t like carrying around large sums of cash. Donald also notes that, due to his medical knowledge gained during military service, he had, less than a month before the murder, typed Dr. Beach's blood as AB. During the trial, however, Dr. Beach's blood type was grouped as type O. 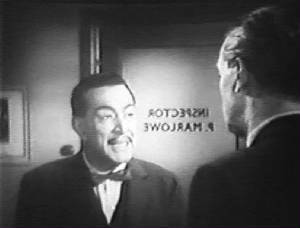 Leaving Donald’s cell, Chan asks a waiting Inspector Marlowe who it was that identified the body of the deceased doctor. Marlowe answers that it was Beach's wife who identified the body. After the Beaches are taken away, Inspector Marlowe calls to arrange for a pardon for Arthur Donald. Inside the mausoleum, Chan, hiding in the darkness, sees the approach of an armed man. Chan surprises the intruder, who, along with Mrs. Beach, flees and is stopped outside by Inspector Marlowe, who calls him "Mr. Wood." "Not Mr. Wood, Inspector," notes Chan, "This is Dr. Beach." Chan explains how Dr. Beach, who had altered his appearance and later posed as the organist at the mission, and his wife had killed her half-brother, Carl Bonner, whom she hated, and later identifying the body as that of her husband in order to collect on an insurance policy. It was Dr. Beach who had planted the murder weapon at the mission in order to incriminate Arthur Donald. Father Dolin (to Prison Warden regarding Charlie Chan): "There's a man in London who can help us; the only man I know." Charlie Chan (to Inspector Marlowe regarding their relationship): "Only with friends is great frankness possible." 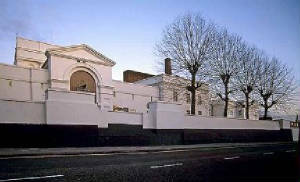 Pentonville Prison - Located in London, Pentonville Prison opened in 1842. The final execution took place there in 1961. This prison also appeared in Charlie Chan in London (1934). 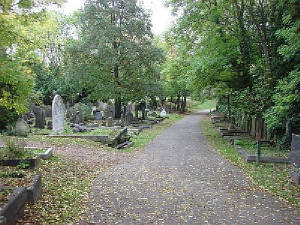 Highgate Cemetery - Located in north London, Highgate Cemetery opened in 1839. It's picturesque wooded grounds serve as a final resting place to many notable figures including Karl Marx. Smoke of sincerity indicates fire of truth. Trying to save human life is ample pay for services. Only with friends is great frankness possible. Sincerity of police is out of question, but not their infallibility. Of course, intuition is not admissible for as evidence, but sometimes it solves many problems. Credulity, unlike elastic, cannot stretch. Woman gives birth to child on small island. There is no birth certificate to prove same; nevertheless, mother is convinced of child’s existence. Of all motives, jealousy is the strongest. To prove innocence with cooperation is difficult – without it, impossible. Sometimes it takes more courage to face realities of life than to die. Even smallest drop of rain gives hope to parched flower.